This Homemade Buffalo Sauce Recipe makes a quick and easy homemade version of a classic! 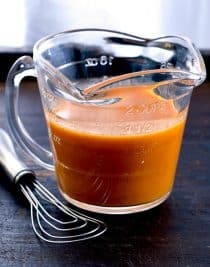 Whisk together melted butter, hot sauce, vinegar, Worcestershire sauce, and garlic until well combined. Store in an airtight container in the refrigerator, shaking to blend well before using, for up to one month.